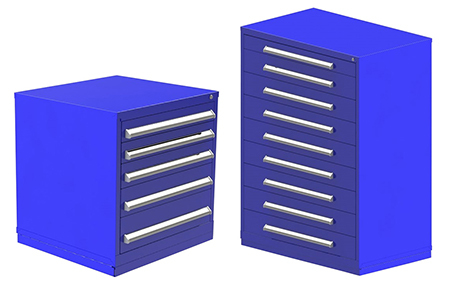 Outfit your tool crib with extra security and organization with these lockable cabinets. Drawers in preconfigured heights densely store tools and small parts to maximize your space and allow workers to find what they need when they need it, saving valuable time. Welded steel components make each unit durable and reliable. Dividers and partitions are available upon request, and other customizations are also available, including casters, colors and other features. STD-32-2-5-1-6-1-7-1-9 32-1/8" 30" 27-3/4" (2) 3-7/8", (1) 4-5/8", (1) 5-7/16", (1) 7-1/16" 2,000 lbs. STD-32-2-6-2-10 32-1/8" 30" 27-3/4" (2) 4-5/8", (2) 7-13/16" 1,600 lbs. STD-32-4-6-1-8 32-1/8" 30" 27-3/4" (4) 4-5/8", (1) 6-1/4" 2,000 lbs. STD-32-2-4-4-6 32-1/8" 30" 27-3/4" (2) 3-1/16", (4) 4-5/8" 2,400 lbs. STD-69-7-7-2-10 61-1/8" 30" 27­3/4" (7) 5-7/16", (2) 7-13/16" 3,600 lbs. STD-69-4-6-1-7-2-9-2-10 61-1/8" 30" 27­3/4" (4) 4-5/8", (1) 5-7/16", (2) 7-1/16", (2) 7-13/16" 3,600 lbs. STD-69-1-5-8-8 61-1/8" 30" 27­3/4" (1) 3-7/8", (8) 6-1/4" 3,600 lbs. CHW-32-3-5-1-8-1-9 32­1/8" 45" 27­3/4" (3) 3-7/8", (1) 6-1/4", (1) 7-1/16" 2,000 lbs. CHW-50-2-4-3-5-2-6-1-7-1-8 46-1/8" 45" 27­3/4" (2) 3-1/16", (3) 3-7/8", (2) 4-5/8", (1) 5-7/16", (1) 6-1/4" 3,600 lbs. CHW-50-2-5-2-6-2-8-1-12 46-1/8" 45" 27­3/4" (2) 3-7/8", (2) 4-5/8", (2) 6-1/4", (1) 9-7/16" 2,800 lbs. CHW-69-10-4-3-5-2-7 61-1/8" 45" 27­3/4" (10) 3-1/16", (3) 3-7/8", (2) 5-7/16" 6,000 lbs. CHW-69-3-7-3-16 61-1/8" 45" 27­3/4" (3) 5-7/16", (3) 12-5/8" 2,400 lbs. CHW-69-1-5-4-7-2-10-1-16 61-1/8" 45" 27­3/4" (1) 3-7/8", (4) 5-7/16", (2) 7-13/16", (1) 12-5/8" 3,200 lbs. CHW-69-1-5-8-8 61-1/8" 45" 27­3/4" (1) 3-7/8", (8) 6-1/4" 3,600 lbs.